Stock status is current as of 4/21/2019 2:45 PMET. Power cords used in hospitals and other medical settings must conform to strict standards for grounding reliability, assembly integrity, strength and durability, as well as regulatory standards such as NEMA and IEC specifications. These standards are in place to ensure that power cords are safe and reliable for use in demanding hospital environments. The hospital grade power cord selection from C2G, formerly Cables To Go, offers one of the broadest selections available on the market. From a vast selection, you'll find the right solution for replacing an overused or misplaced power cord, or to optimize office or lab layout with a cable that is the perfect length needed. 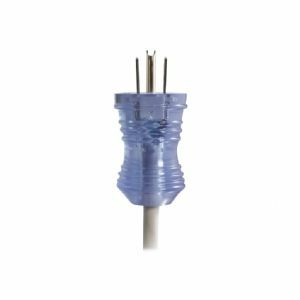 This cable, from the universal C13 series collection, will work with most PCs, monitors, scanners, printers and many other devices that are powered via the industry standard 3-pin C14 connector inlet. The female C13 connector plugs directly into the device while the male hospital grade 5-15P connector plugs into a hospital grade supply outlet. The clear connectors work with almost any environment or hospital standard. Easily recognizable with the Green Dot mark, this hospital grade power cord ensures compliance and delivers maximum performance.